We were in the Manila area a few days ago and decided to have lunch at the Manila Ocean Park since it's been almost 2 years since the last time we visited. Aside from the aquarium area we were pleasantly surprised that the mall side was almost filled up with stores and restaurants. One great addition was Makansutra, a resto that offers a variety of Asian cuisine. I was pretty pleased that Makansutra had teh tarik and I immediately ordered a glass (it's just PhP45!). 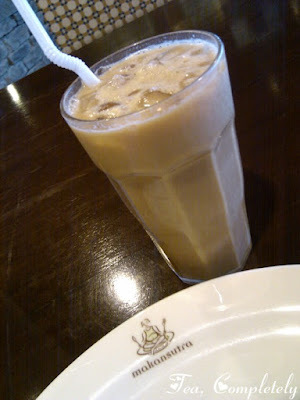 Ahhh... at last a place I can get authentic and yummy teh tarik.